Lower Saxony covers 47,000 square kilometres of land, and so its Music Festival caters for the biggest catchment area in Germany. Launched in 1987 with just nine concerts, the Music Festival is now a major occasion offering a programme of 60–70 events. For four weeks of the year, musicians of international renown perform throughout the state, even in the smallest communities. But big names and wide spaces do not in themselves make a festival. The Niedersächsische Musiktage have built a unique profile by meticulously translating themes into music, creating innovative formats and meeting high professional standards. 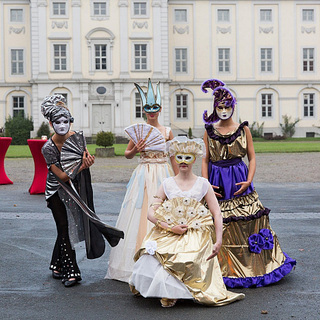 The festival is organised by the Niedersächsische Sparkassenstiftung, a trust established by the savings banks in Lower Saxony. An unusual structure enables the trust to work in harness with local organisers and savings banks so that the Music Festival is managed and financed under one roof. This means the trust can uncompromisingly pursue one of its key objectives – empowering regional culture by networking across borders. The festival thrives on its regional roots by involving local people, whose enthusiasm is a driving force behind the programme. The Lower Saxony Music Festival is a feast of discovery. We bring a distinctive note to conventional concert-making, with regional features respectfully built into the programming. Many events are devised specifically for venues typical of the region. 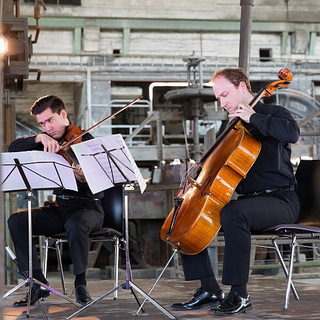 Our programmes are diverse and original, quite distinct from the usual concert routine. We explore new directions and create surprising situations that reflect the annual theme, reaching out to a broader audience for the music and appealing to new target groups. Our Music Festival is all about enjoyment and an inquisitive desire to listen, experience and discover. Ever since it began in 1987, the festival has been inspired by the principle »In Lower Saxony, for Lower Saxony, by Lower Saxony«. That still applies today. The theme for each Lower Saxony Music Festival is chosen years in advance. It provides an all-pervasive common thread for the event, casting new light on apparently familiar aspects of the music. Every year guests can look forward to concerts outside the usual touring repertoire: our musicians create performances exclusively for the themed festival, programmes which cannot be experienced anywhere else. The Lower Saxony Music Festival has always been adventurous. Innovative concert formats, unconventional venues and (as yet) unknown performers pose constant new challenges. But then: nothing ventured, nothing gained! Tamed, but by no means tame – the theme chosen for the Lower Saxony Music Festival in 2015 is »adventure«. Katrin Zagrosek describes the exciting process of orchestrating an unruly leitmotif and shares some insights into the adventurous programme. The ideal way to listen to music is to treat it as an adventure. By putting aside ready-made expectations, opening up our senses and being alert to new discoveries. Even if we have heard the piece before, this is the key to experiencing the full power and beauty of music. I cordially invite you to embrace our »Adventure« concerts boldly and without preconceived ideas! Whenever I begin to work on a theme, the floodgates open and countless associations, concepts and sounds come rushing towards me. Like wild young horses galloping this way and that, these many-facetted themes that are such a hallmark of the Festival rear up on their hind legs begging to be tamed. The first thing I have to do is knock a few pegs into the ground and tie the theme down. The programme has to be attractive, but not arbitrary, so I concentrate on a few central aspects which seem particularly important to me. The 2015 season is no exception, of course, although »adventure« is a particularly unruly theme to orchestrate. When we think of »adventure«, we are soon caught up in stories of knights in shining armour or cowboys on hot-blooded stallions, the stuff of boyhood dreams. What better setting for the prelude to a festival of adventure than the home of horses in Lower Saxony: Verden. At the Opening Weekend for the Lower Saxony Music Festival, four special events will highlight major aspects of our theme: we will meet the adventurer Störtebeker, embark on listening adventures with jazz trumpeter Till Brönner and a sunrise concert, and discover art and music (and of course horses, even real thoroughbreds!) on the picturesque farm at Gerkenhof. After the initial fanfare at the Opening Weekend, more listening adventures with jazz star Till Brönner await you. He will perform five more times on a 360-degree radius around Lower Saxony, setting out on his acoustic expeditions in a duo, a quintet and a large orchestral formation. Richard Galliano, the doyen of the accordion, will meet young mandolin player Avi Avital for a musical escapade with equally unpredictable results. One thing is certain, though: it will be an unforgettable and inimitable evening (Obernkirchen, Nörten). 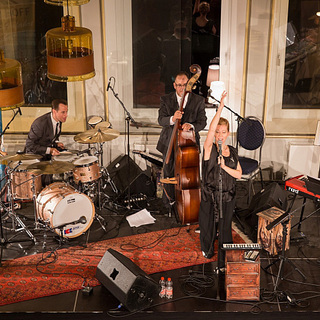 Duke Ellington demonstrated with his impressive Sacred Concerts how fertile the encounter between jazz and other musical spheres can be: the Junge Vokalensemble Hannover, the big band Fette Hupe, tap dancers and singers have »unearthed« his work and will perform it in Melle, Northeim and Lüneburg. We have two more jazz greats among our guests: Rebekka Bakken and Jasmin Tabatabai. Jasmin Tabatabai will sing just for once in Farsi and talk about her original home, Iran (Barsinghausen, Alfeld, Peine, Celle). Rebekka Bakken awaits you for an exclusive encounter in a place redolent of adventure – the Paläon, the research and experience centre near Schöningen.